Health Pledge is a campaign led by ordinary people. We are not doing this on behalf of the NHS, medical professionals, politicians or civil servants. We are hoping to inspire people to take action to improve their health. The campaign aims to encourage and support people to take small steps to make big improvements. 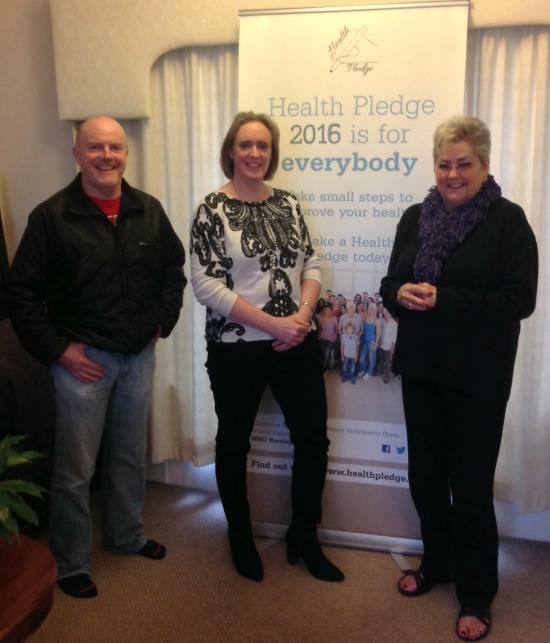 Health Pledge is an initiative of Thornley House Patient Participation Group. It is the brainchild of Ingrid Brindle who assembled a crack team to bring it to life. The team is pictured below, from the left Dominic Sexton, Jacqui Gladwin and Ingrid Brindle. We have worked very hard to put the campaign together and hope you will reward us with your support. The Health Pledge Team would like to thank the following for their support in the campaign. Information provided on this website is available only as guidance. The Health Pledge team are not registered health professionals and therefore if you have any concerns regarding your health or the advice provided please check with your local health care provider. If you have an existing health condition you should discuss any specific changes you would like to make with the health professional responsible for your care prior to implementing them.